Such a simple name for a complex city. As Morocco's cultural and spiritual center, Fez was a must-see on our list, particularly because of the medina (an old walled part of the city - common in many north African towns). The Fez medina is a UNESCO World Heritage Site and is the closest I've come to stepping back in time. Donkeys, mules and handcarts are the main means of transportation in the medina. clothes (traditional and modern), shoes (new and the ones straight off a seller's feet), wedding decor and dresses, trinkets, headscarves, jewelry, tea, coffee, spices, produce, meat (up to and including camel meat from one specialty butcher), leather goods, metal goods, pots, pans, all manner of cooking utensils, copper sinks (for the kitchen and otherwise), books, electronics, furniture, antiques (real and not). The only camel butcher in the medina, as far as I know. The size of these stores range from smaller than your master bedroom closet to surprisingly spacious. There are also food stands, restaurants and tea houses in the same range of sizes. And remember, all of this business is done without a cargo loading area. I stepped aside in the alley for more donkeys to pass than I did for elderly people. 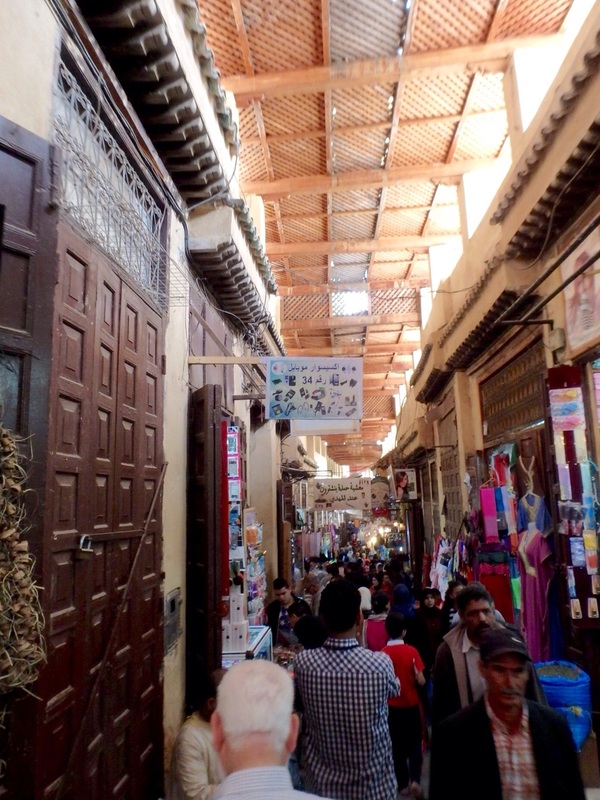 One of the wider alleys inside the medina. Personal affairs are also conducted differently there. For example, the best source of neighborhood information comes from an unexpected place: the baker. Every neighborhood baker becomes this source and confidant because every family kneads their dough at home and brings it to the bakery to cook. So, it becomes the one place everybody visits daily, and subsequently, gossips daily. If a family is looking into a potential marriage for their child, the baker is often still the person they ask about the other family to see if it is a good match. Aside from gossip, the medina is also home to a gorgeous mosque I was only allowed glimpses of (non-Muslims are not permitted to enter) as well as many former schools, or medersas. Other hidden gems included our accommodations. We stayed in Fez for a few nights in a beautifully restored guest house, or dar. These guest houses operate much like a bed and breakfast, only you wouldn't see a charming farmhouse or an elegant Victorian home on the outside. In the medina, there's no room for that. Instead, you're more likely to roll right past it because their entrances look just like the rest - guarded by a heavy, creaky wooden door. But stepping inside felt like walking into an oasis among the madness of the old city. The guesthouse, Dar Serrafine, had a beautiful inner courtyard that opened up to the sky and a rooftop terrace to view the medina. In the midst of donkeys, hand carts and people shouting, the dar was somehow insulated from it all, a place where it was just quiet enough to hear the birds. An old medersa, now a small museum. Buying linens in an artisan shop was a much better experience than being haggled on the crowded streets. Leather goods are still made in the traditional fashion at this tannery in Fez. Inside the courtyard of a a large guest house and restaurant. This is madness. This is the medina. Turn 180 degrees around from the view of the medina and this is just on the other side of the hill.